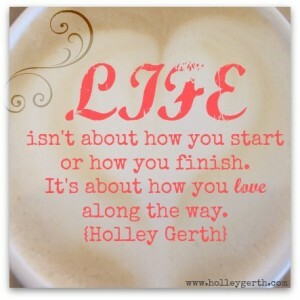 I have recently started following Holley Gerth and I love, love her style, her encouragement and her daily blog. Since we are writing about love this month, I wanted to share this image recently posted by Holley. I truly believe God has created us to share love as well as receive it. God is Love and we are created in His image. So join me this month in being intentional in your love. How do you share it in your life?